No classic computer collection should be without an Apple Lisa. 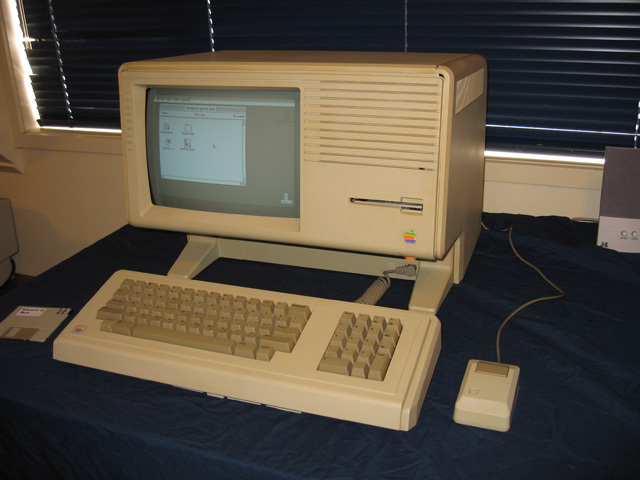 Although Apple didn't invent the concept, with the Lisa they introduced the commercial world to mouse-driven "point and click" computer-human interaction and the graphical user interface or GUI. I only wanted one, but somehow I ended up with three non-working specimens! There were two very yellowed Lisa 2s and one Lisa 2/10. After an initial assessment I found I had enough working parts to attempt repair of one of the Lisa 2s and the Lisa 2/10. I've now got a working example of the former, which is the subject of this article. Mixing and marching parts from the two Lisa 2s gave me a machine which passed all its error checks and got to the stage of booting from a floppy. However, rather than booting, the computer simply sat there doing nothing. It wouldn't even eject the floppy, which then had to be retrieved manually. Figure 1. Why didn't this drive do anything? I cleaned, reconditioned and swapped in all three 400k drives that I had. They all did the same thing?! I also swapped over the two LisaLight disk controller cards available. Same result. By this time I'd enlisted help from the Classic Computer mailing list. Checking the readings on the drive pins didn't reveal anything untoward. I was stumped! That is until a member of the CC mailing list asked me if I was using a Double Sided/Double Density disk rather than the more common High Density disk. Actually I WAS using a blank HD disk as I just wanted to ensure the drive mechanism spun and ejected. Loading software was going to be the next stage. I tried a DS/DD disk and lo and behold, motors whirred and the Lisa spat the disk out on the boot attempt. The drive was firing after all! Turns out the Lisa 2 uses a plastic peg to detect the presence of the disk and this peg (coincidentally) pokes right through the hole present in HD disks! As far as the Lisa was concerned, there was no disk in the drive. No wonder it wasn't doing anything! My Lisa 2 had no hard drive so there was no way I could run the Lisa Office Suite. I should be able to run Macworks though, from a single floppy. The problem was how to get the Macworks software from the Internet onto a 400k Lisa-readable floppy disk? With the help of this site and some trial and error, I found the solution. 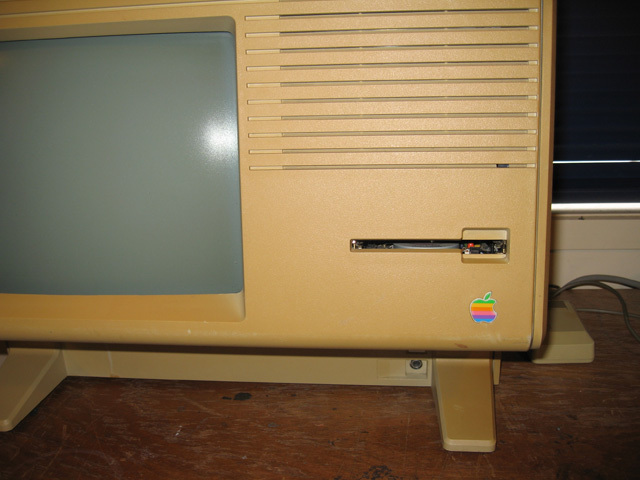 First, I set up one of my Mac Classic IIs as an intermediary, attaching an 800K Apple 3.5 inch external drive to it. Using a piece of software call TransMac, I was able to transfer MacWorks SIT files, originally in HQX format, into a 1.44 Mac formatted HD disk in my PC floppy drive. These files were then transferred to the Classic II where I then used Stuffit extractor software to extract the disk images. After formatting a single side of a floppy in the 800k drive (hence making a 400k single-sided disk) I then used a program called Disk Copy 4.2 (also transferred by TransMac originally) to copy the images onto what was now a Lisa-enabled floppy. I ended up with two disks for my machine: a MacWorks System disk and the Mac emulator disk required to boot the Lisa. Both the Lisa 2s were the colour of stale cheddar cheese. Yuk! 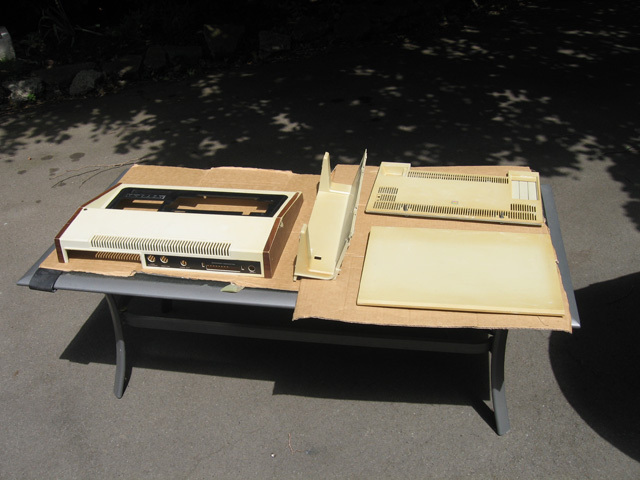 I wanted to return my machine to the cream beige as shown by my Lisa 2/10 so I spent a day retr0Brighting it. After 8 hours in the sun, the various panels had returned to their original colour. Nice. The keyboard cover was treated with a variation of the technique that was not only cheaper but required no H2O2 at all! I was very happy with the result. 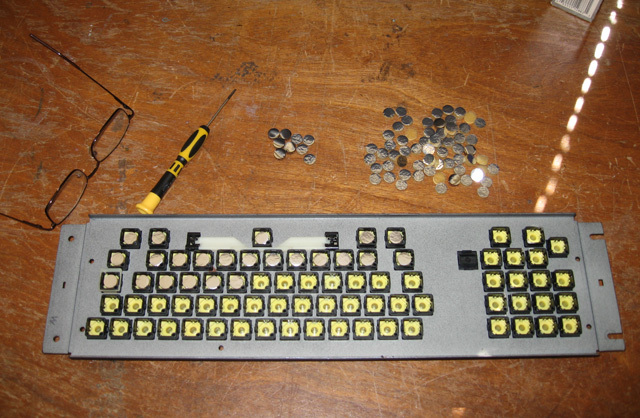 The final problem involved the keyboard. None of my three keyboards worked! Well, that's not strictly true. On one keyboard the "4" on the numeric keypad worked, on another the "/" worked. No keys worked on the third. I found it was common for Lisa keyboards to fail over time. 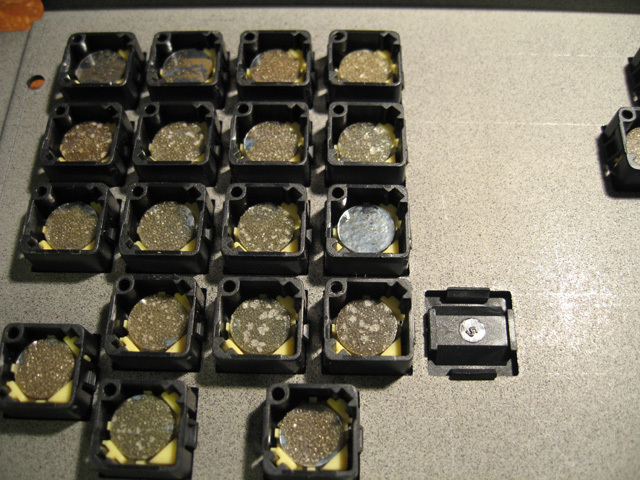 The reason is that the internal foam plugs underneath the plungers of each key degrade. All my plugs were seriously degraded. Figure 4. Seriously degraded Lisa Keypads. Note the silver one: the only one that worked! I flirted briefly with trying to make my own according to these instructions before deciding to snaffle some that happened to be for sale on the Vintage Computer and Gaming Marketplace. These duly arrived, were fitted and tested. They worked. I now had a fully-working Lisa 2! Figure 6. Input from the Lisa 2 keyboard. The grey area is due to a strobe effect when photographing. It's been a lot of work to get this Lisa 2 up and running. I've certainly learned a lot about these machines. 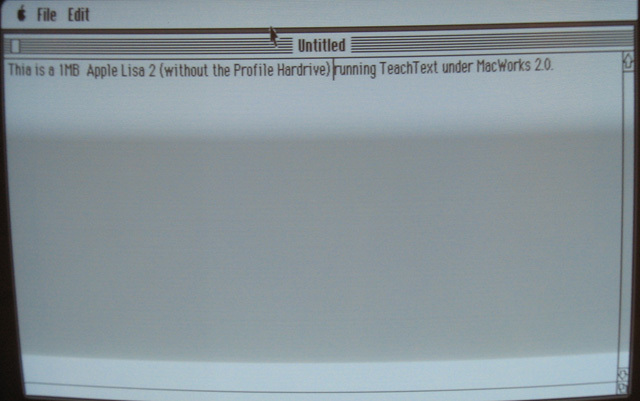 Most Lisa 2s were sold with a Profile hard drive, which sat on top of the unit. As mine doesn't have one, it can only run MacWorks, not the Lisa Office Suite. In practice then, until I get a hard drive my Lisa 2 is really just a large Mac Plus! I am pleased to have it up and going though. It looks just fine. Various Lisa support sites on the Internet were invaluable! Also once again I was helped by folk on both the Classic Computer mailing list and the Vintage Computer Forums. My thanks to them. P.S. I've now managed to fix the Lisa 2/10 also!